Hold these dates for your calendar. 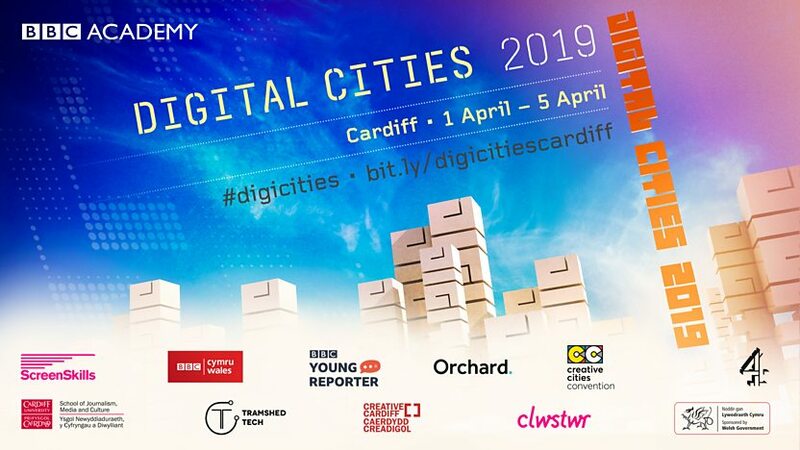 Digital Cities Cardiff is back from 1 to 5 April 2019, with a packed week of mainly free events for people in the creative industries and tech sector. The massive growth of on-demand video, streaming, podcasting and short form video on social media platforms means that media producers need new strategies and content formats, particularly if they are to reach younger audiences. This day provides audience insights, practical production skills workshops, and the opportunity to find out what the BBC, S4C and Clwstwr are planning to commission. New technology and platforms are transforming the way stories are told, who is telling them and where audiences find news and entertainment content. This day provides insights on these trends and seeks to forge new collaborations between local tech companies and the media production sector with a focus on screen and News innovation. Cardiff is one of the fastest growing centres for the technology and creative industries in the UK. This day is focused on inspiring and supporting graduates, aspiring entrepreneurs and owners of SME’s to start and scale their business ideas. The day includes growth insights, practical workshops, interviews with successful entrepreneurs and 1 to 1 advice from business support organisations. Tickets are available for some sessions already and the rest will be available by 11 March. Most events are free and open to anyone working, or wanting to work in the tech and creative industries. Follow #DigiCities for the latest information. This page is updated regularly so keep checking back for the latest information. Follow @BBCAcademy on Twitter for the latest information, such as when you can book tickets. creatives and tech companies solve the challenges in News? The Creative & Cultural Skills National Conference and Awards is a key moment in the calendar for employers, educators and policy-makers in the creative and cultural industries. This year, for the first time, the National Conference and Awards is heading to Cardiff and will be followed by an Awards ceremony that evening at the National Museum. This two-day convention is a meeting place for everyone in the broadcasting industry. With a theme of Let’s Be Friends, the focus of this year’s event is on the importance of working together with a stellar line-up of speakers giving food for thought and discussion.